Brodie Irvine has been named as the 2017 Jethart Callant. Jethart Callant’s Festival celebrates its 70th year this summer, and the young man chosen to lead its festivities is Brodie Irvine. The 21-year-old electrician was announced to huge cheers last Friday evening as one of the Borders’ best kept secrets was finally outed by the town’s honorary provost, Hugh Wight. 2017 Jethart Callant Brodie Irvine is carried aloft by his right and left-hand men Gary Hogg and Grant Raeburn. And for Brodie, the first in his family to be named Jethart Callant, the last five months have been long ones as he struggled not to let the cat out of the bag. 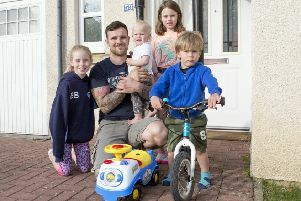 It was a relief too for his parents – Jake, a property manager in Edinburgh, and Lara, a library assistant in Hawick – as well as his elder sister Christie, a hairdresser in Jedburgh. The Jed Legion Football Club player is the grandson of well-known Jedburgh runner Jock Steede and his wife Margaret, both of whom will be supporting him this summer alongside his other grandmother, Eileen Irvine. Jethar principals Brodie Irvine, Gary Hogg, Grant Raeburn and Brian Marshall. Brodie, of Mansfield Park, studied at Howdenburn and Parkside primaries and Jedburgh Grammar School before completing his apprenticeship at Borders College in Galashiels with Kelso-based John Rae Electricals, his employer for the past five years. He first followed the festival on horseback in 2003 behind callant Jamie McCraw at the age of seven and started riding lessons again in January, which, he says, will stand him in good stead for his first rideout following Hawick Cornet Ali George to Mosspaul next Saturday. His girlfriend, Amy Headspeath, 18, of Galashiels, has been accompanying him during his lessons and plans to follow on horseback where possible between her duties as callant’s lass. Ex-callants Harry Wright and George Miller. Looking ahead to the summer, Brodie added: “Festival day obviously will be a big one for me, but getting to lead all the other rideouts and seeing everyone out in support will be just as important. On Friday, Brodie was carried out shoulder-high from the town hall by his right and left-hand men, Gary Hogg and Grant Raeburn, and they will support him this summer alongside herald Brian Marshall. He was met with a rousing reception from crowds along the ramparts as, in a change from tradidion, the announcement was made from the town hall due to ongoing building works at the courthouse. Jethart Callant's Festival principals at the declaration of Callant Brodie Irvine. The celebrations that followed inside the town hall saw speeches from the provost, ex-callant Peter Johnston, festival convener Len Wyse, ex-callants’ association president Mike McGovern, Brodie and his father Jake. Brodie was presented with his Lanton horseshoe and Balmoral by Lanton and Glendouglas community councils respectively. This year’s festival week runs from Saturday to Friday, July 1 to 7, with the first rideout two weeks before to Morebattle on Sunday, June 18. Crowds gather on the ramparts for Jethart Callant's declaration night. Brodie Irvine has been named as the Jethart 2017 Callant. Jedburgh Royal British Legion Pipe Band.